After we published the iCloud programming tutorial, the first question from our readers is not about iCloud but related to the static table view. 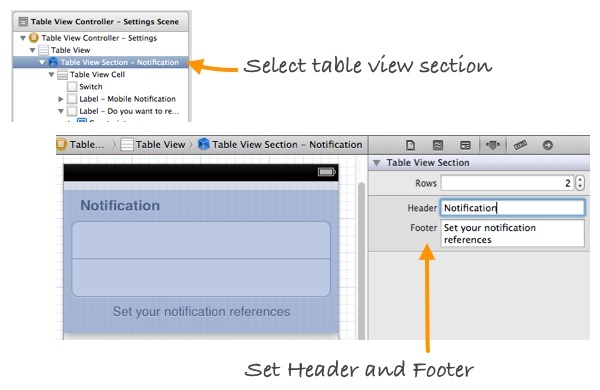 If you’ve followed our tutorials, you should have a basic understanding about table view. However, the table views that we’ve covered are of dynamic content. The “Add Note” controller that we built in the previous tutorial, on the other hand, makes use of the static table view. 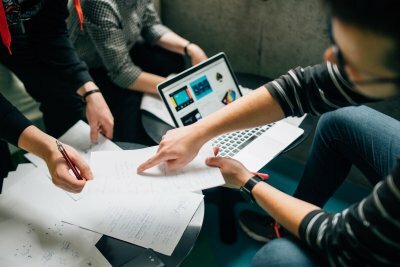 If you have problem with static table view, this tutorial is for you. 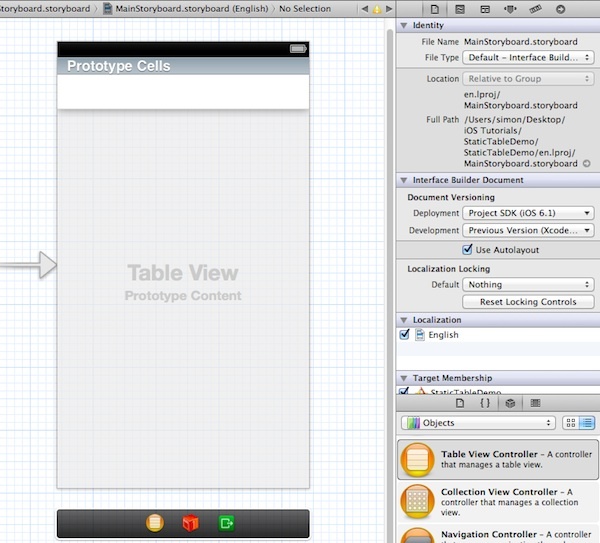 We’ll show you how to create static table view using Storyboard. To illustrate how easy you can use Storyboard to implement static table view, we’ll build a simple Setting screen. Static table views are ideal in situations where a pre-defined number of data items to be displayed. A setting screen is an obvious use of static table view. 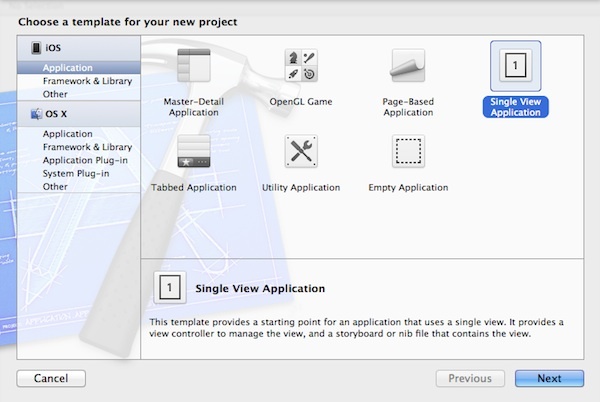 To get started, launch Xcode and create a new project using the Single View Application template. 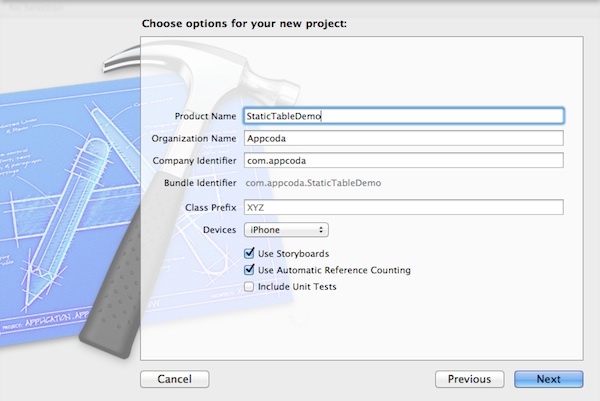 Name your project as “StaticTableDemo” and don’t forget to select “Storyboard” in your project setting. In Storyboard, first delete the default view controller and drag a Table View Controller from the Object library. By default, Xcode sets the table view for dynamic content. You can easily change the table view from dynamic to static cells by altering the content property. Once changed, you’ll have a table view with three empty static cells. To get the desired view of the Settings screen, change the table style from “Plain” to “Grouped” in the Attributes inspector of the table view. You have two ways to change the number of table row from 3 to 2. The easiest way is to select one of the table rows and press delete button to remove it. Alternatively, select the Table View Section in the document navigator and change the row number. You can use header and footer to display addition information for the table section. Set the header and footer as shown in the above screen. Drag a label object into the table view cell and adjust its size to 17. Set the label to “Mobile Notification”. Drag another label object into the table view cell and place it under the previous label. 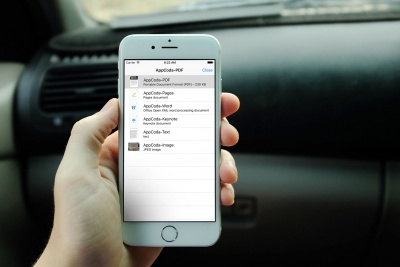 Adjust its size to 10 and set the label to “Do you want to receive push notification?”. Drag a Switch object into the table view cell. 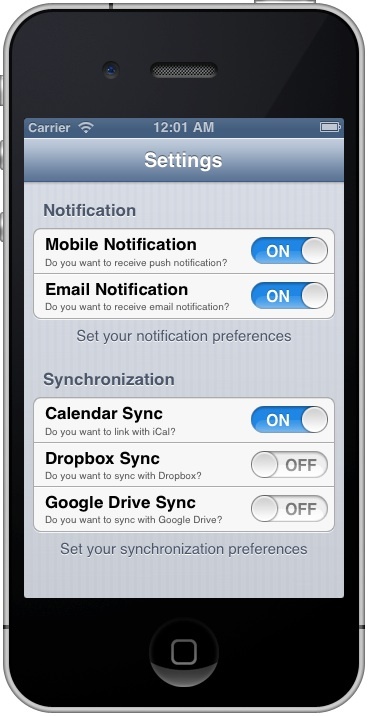 Repeat the above procedures to implement the “Email Notification” cell. We’ve created the first table section. To add the second section, select the Table View and change the “Sections” value in Attributes inspector to 2. As soon as you update the section number, Xcode adds a new section and the same content of the first section is automatically copied. 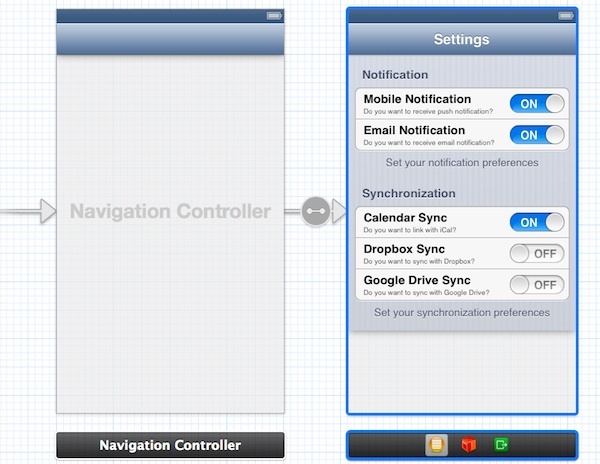 To complete the layout of the Settings screen, embed the table view controller in a navigation controller. 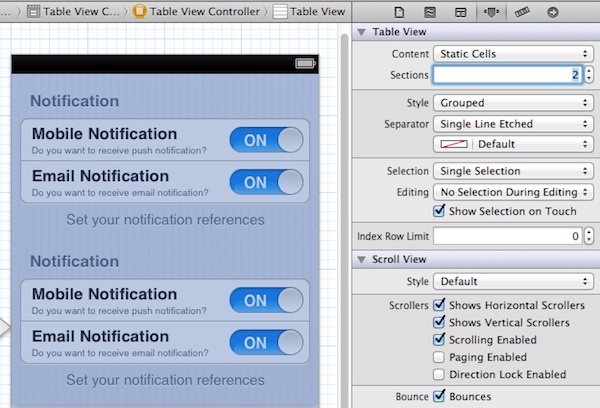 Select the table view controller and select Editor -> Embed in -> Navigation Controller from the Xcode menu. In this short tutorial, we demonstrate how you can create a static table view using Storyboard. While you can use dynamic table to display data from data source, static table view provides a great way to display a finite quantity of data that are already known beforehand. Settings screen is a common example that you can make use of the static table view. For your complete reference, you can download the Xcode project here. As always, leave us comment if you have any questions about the tutorial. I have a question for this one. How do you design a Table View with 5 or 6 groups, I can’t find a way to scale or move the Table View so I can work with the groups in the bottom. You can create as big Table View as You wish, just use scroll wheel then – to can scroll down a table view in StoryboardEditor and customize cells and groups. Hope this will help. 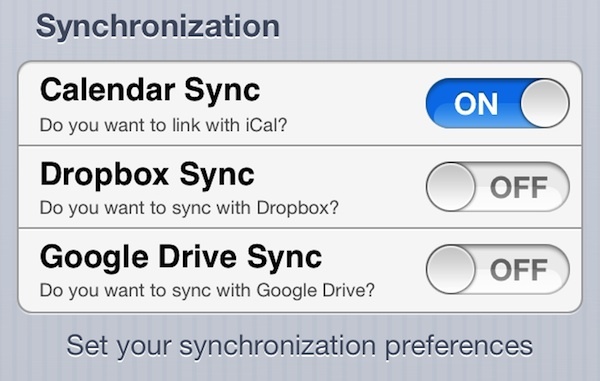 You have write tutorial about iCloud, so maybe you tell us about EventKit and examples with Custom Calendars? It will be great. Greate tutorial.how to change the background color? FYI: Might be worth mentioning that you need to “clear out” the TableView class first, that you’re creating to use for this. Otherwise it will complain and warn you about sections and rows etc. How did you add actions to switches..??? help me adding .h and .m file to this view controller…. Thank’s 4 the Tut, Simon. 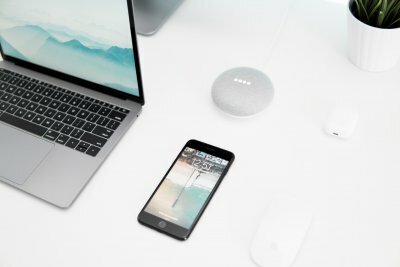 how can i localize here the header and footer? Great tutorial , how can we set action on each of the cell in table view ? Hi Thanks for good tutorial:) I have a question how to had the section footer appear in the center? I try to do it but cannot. Use control-drag to wire up. So following this in Xcode 5, gives you a blank screen, I know I’m missing something here. Great tutorial. I always forget the steps to go through for static cells. Thanks a million! For those below having problems then subclassing the view in Storyboard, after creating a UITableViewController and connecting it to the view, go in and either delete or comment out the template code, which is actually for dynamic cells. In particular, blocking out the following methods will prevent the blank-screen thing, and will also allow you to hook up outlets as usual to your .h file.